In Germany, real quarterly GDP growth slowed to 0.3 % in Q1 2018 from 0.6 % previously. In annual terms, GDP expanded by 2.3 % after 2.9 % in Q4 2017. Positive contributions came from domestic demand. In particular, gross fixed capital formation in machinery and equipment rose 1.2 % and gross fixed capital formation in construction was up by as much as 2.1 % (q/q, seasonally and weekday adjusted). Also, household final consumption expenditure increased slightly (+0.4 %). Government final consumption expenditure had a downward effect on GDP growth. The development of foreign trade was less dynamic. Total exports of goods and services were down 1.0 % compared with Q4 2017 and imports decreased to a similar extent. The Q1 GDP growth slowdown was in line with slower growth in the total of the Euro Area (0.4 q/q % in Q1 after 0.7 % in Q4 2017). It is also in line with recent developments in economic surveys. In May, purchase manager indexes (PMI), which usually have a high correlation with GDP, have continued a softening that had started early in the year (Figure 1 - see pdf). The German ifo-business climate and the Euro Area sentiment surveys (EC) stalled in May/April after softening since the start of 2018. Overall available data suggests a gradual slowdown in the expansion of economic activities from the previously elevated levels, that is supported by our real-time GDP nowcasting model (Figure 2 - see pdf). For now, the nowcast questions a Q2 pick-up following temporary (weather-related) distortions in Q1. Italy’s economy continued to expand slowly in the first quarter (0.3 % q/q). Among Eurozone countries, it should be noted that only Italy remains below the pre-crisis GDP peak. Germany stands at 12 %, Austria at 10 %, France at 8 %, Spain at 3 % and Italy at minus 6 % above/below the peak of GDP ten years ago (Figure 3 - see pdf). Essentially, the Euro crisis that culminated in 2011 and 2012 was invoked by large balance of payments imbalances (Figure 4 - see pdf). Southern European countries and Ireland had piled up large deficits in the current account – the account of exports and imports of goods and services to and from foreign countries, plus net foreign income. For each year, current account deficits/surpluses mirror the decrease/increase in a countries net foreign wealth. In other words, a country with a current account deficit is importing present consumption and exporting future consumption. 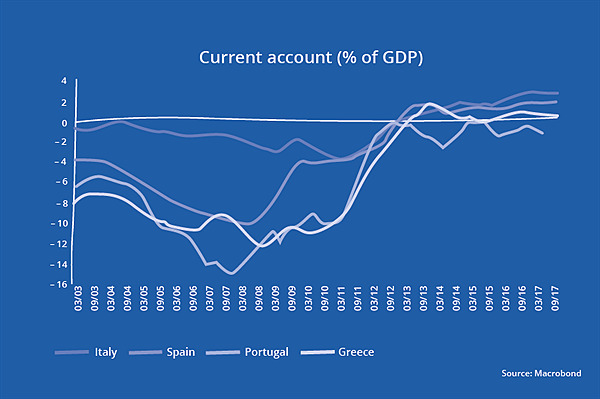 At its peak, Greece had a huge current account deficit of almost 15 % (2007), Portugal of 12 % (2009), Spain of 10 % (2009) and Ireland of around 6 % (2008), while on the other side, the Italian economy never had such a large CA deficit (-4 % in 2011) during that period. Eventually, as part of an economic adjustment when foreign funding for large CA deficits became scarce, these economies entered recessions (GDP 2012: Italy -2.8 %, Spain-2.9 %, Portugal -4.0 % and Greece -7.3 %) during the Euro crisis. Followingly, sharp contractions in the domestic demand and structural reforms helped to restore international competitiveness of their economies as can be seen by looking the real effective exchange rates (Figure 5 - see pdf). The real effective exchange rate (REER) is calculated from the nominal exchange rate and trade-weighted price or cost deflators, such as the consumer price index, the GDP deflator or labor cost. It shows the movement in prices/costs of domestically produced goods relative to the prices/costs in foreign countries. To that respect, Euro crisis countries restored pre-crisis competitiveness levels, except for Italy with a very sticky trajectory in the real effective exchange rate. Spain (1.9 %), Portugal (0.5 %) and Italy (2.8 %) run current account surpluses since 2013 and Greece has almost balanced its current account. Italy’s economy remains the big growth laggard in the Eurozone, however, contagion from common balance of payments deficiencies among Europe’s Southern peripherals won’t cause another Euro crisis.